Hey all you Mods and Rockers. The fate of the world is in your hands. At least in this film that is. A wild mixture of British pop and rock with a Romeo and Juliet theme jammed in. 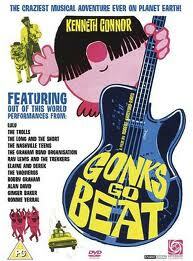 That's what 'Gonks Go Beat' is all about. Run! Scream! It's a Skunk Ape! Hard Rock Muscians Turned into Mindless Zombies!